Last week just before she left to go back to college for her junior year, MOD (My Outstanding Daughter) and I made a last, sentimental trip to Borders, her childhood bookstore. As we entered, I walked toward the back of the store—toward the children’s books. “Mom? Why are you going to the kids’ section?” MOD sounded worried that I might force her into a walk down memory lane. H is the mother of one of MOD’s classmates from high school. Every time we go to Borders, H helps us when we can’t find something—whether it’s in the children’s section or not—but more importantly H knows books and has given me great reading advice over the years. I hadn’t talked to H since I found out Borders was closing, and I wanted to see how she’s doing, and (I admit) I also wanted her take on the closing. We found H right away, standing by a shelf busy as always. H is one of those archetype bookstore “bookies” who is always talking to a customer, putting away books, tidying up, or getting familiar with the merchandise. She loves books and it shows; she’s the kind of person everyone wants to work in their neighborhood bookstore. H was happy to see us, and the first thing she did was ask my daughter all about college and how her summer had been. Then we visited for a while longer, catching up on her kids, my kids. Before that day, I’d never seen H anything but happy at work, but of course those days are gone. That day, H was somber because, in addition to losing her job, H is losing something else: her local bookstore. And she’s really sad about it. We shared her sadness and we told her this was our last trip to Borders together, MOD and me. I asked H how the closing is going and how much longer they’d be open. She wasn’t sure how much longer, but she said even though they are still open, the store is much different. Then I showed H the photo I took the day before at Target—a mother reading to her two young daughters, sitting in an aisle on the cold linoleum floor. I wondered. Maybe nothing willfill the gap and Target, or places like it, will be the new bookstore—or worse…. I asked H if she thought it was the beginning of the end for all bookstores. H said customers would often come into Borders for a book, and when they couldn’t get it right away or saw the price, they would say: “Oh I’ll just get it on amazon.” She wonders if that’s part of the reason Borders failed. And what about ebooks? I asked H, and I learned something about her I never knew before. She’s not so sure whether all the technology is moving in the right direction. H handwrites all her letters to her two kids who are in college out of state. She certainly knows how to use the technology; she just chooses not to. In the end, we got some great bargains: two calendars, four postcards, and five books for $79. But despite the bargains, we lost something too. We said goodbye to our friend H and our neighborhood bookstore. And we couldn’t help but wonder if it might be the last time we would ever be at a bookstore together anywhere. What’s your favorite memory of your local Borders? Do you have friends who work there? Do you think this is the death of all bookstores? Does it matter as long as we have amazon.com? Or ebooks? Oh, Julia. You are as sentimental as I am 🙂 We don’t have a local Borders, but one of my favorite bookstores, a locally owned 30 year old 2 story beauty closed down earlier this year. I blogged about this very thing last week. A lot of people are into the convenience of online buying and reading, but I like tradition and books just own a special part of my heart. I think that, given time, technology changes things. I’m not sure if all bookstores will vanish or if the book will become as ancient as the vinyl record, but if it does, I pray I never see it. I sure hope it’s not the end of bookstores! I’ve never had a neighborhood Borders; it’s always been Barnes & Noble. I often go there to flip through magazines and get ideas for stories. But I’m also part of the problem. I shop on Amazon sometimes. I buy books on Kindle. I take a lot of books out of the library. But I still really like physically going to a bookstore, picking up the actual book, and flipping through it. I really should support these stores more. Thanks for a great post, Julia! I feel the same as you. Borders was the last book store in my little town. It’s where I went all the time. I loved to just browse. I am so sad to loose it and while there is always the library, it just isn’t the same. I have to fess up to something… I fear I am part of the demise of the brick and mortar bookstores. First of all, it is rare that I buy a new book. I am strictly a library girl. Unless it’s a favorite author whose book just came our and I don’t want to wait for my library to get a copy. Also, I do most of my buying off amazon, even if I’ve viewed the book in Borders or Barnes and Noble (I know, everyone’s ready to throw stones at me). But I can’t justify spending $15-25 on a new book. I’m a SAHM with a husband who is a non-reader, and, thus, there is no way to validate such an extravagance when I can 1.) get books from one of the three libraries near my house, or 2.) buy used books from thrift stores or library book fairs. Regarding Borders though… I am terribly sad that it’s closing. I used to go there all the time and browse the shelves and make the occasional purchase… always the bargain books, or, as I said, a new book from a fave author who wasn’t readily available at the library. I preferred it over B&N b/c they always had the coupons with their FREE membership (unlike B&N which charges $25 yearly). And, though I got a Kindle for my birthday, I’ve only bought two books. All the other books were free. It is so heart-breaking. My mom is beside herself too–not knowing where she will go in Portland now for that experience. And your picture of the family on Target’s floor made me teary–what are we doing losing our bookstores?! You have one of the reasons for brick and mortar stores in general failing in the comments here: People go to browse, not to buy. But the main reason Borders failed are bad business decisions, after all B&N is still around. 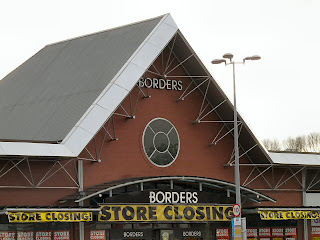 Our local Borders closed as well but I’m not sad about it – it had become an unpleasant hangout for local teenagers who were not there to buy books. And I’m lucky to live in a city with lots of bookstores, chains and independents. The independents seem to distinguish themselves with interesting author events. I think the bookstores will spring back up when the economy recovers. Lots of stores and businesses are closing, not just bookstores. When folks are broke they don’t have money for luxury items. And books are luxury items. We’re writers (mostly) so we see only that aspect that is most painful to us. And Borders closing IS painful. When we were kids, we always went to the Village Green bookstore in Rochester, NY. I’ve moved away, so I’m not sure if it’s still there, but it was a favorite. I had a different favorite bookstore in grad school, and now I spend a lot of time in B&N with my daughters. That said — my proclamation of my love for physical bookstores — I also use the library a lot, and I order from amazon as well. It’s a mix, and I think the future of books and bookstores will be a continual adjustment of that mix. What matters to me is that we always have the stories — telling them, reading them, supporting other storytellers. Anything we can do to inspire a love of stories matters. For me, the pysical format isn’t as important. >And we couldn’t help but wonder if it might be the last time we would ever be at a bookstore together anywhere. This is so sad. I know you already know the story of my favorite Borders, so I won’t repeat it. But I will say it’s even more sad to see it from the POV of an employee like H, who gave her life’s work to supporting bookstores. Charissa, Yes, that’s me, a sentimental sot. 🙂 I’m so sorry about your bookstore — sounds lovely! I completely understand about the online buying; of course I do it myself most of the time — still, this particular bookstore was sentimental because of my kids and of course, H. No doubt time will bring changes… who knows exactly what… life is like that! Jen, I love B&N, unfortunately the closest one to me is an hour away (that’s the ONLY large bookstore left in Maine!). I also am part of the problem because I do shop at amazon and I even own a Kindle and of course I go to the library (that’s another endangered species, I’m afraid). I just think it’s a changing landscape out there for many industries, including books, newspapers, etc., and it’s going to mean changes…. like reading at Target or not seeing a physical paper, etc. Kaydee, It really isn’t the same — so I’m sorry you’ve had to experience the same thing! The library is wonderful but different. I think my kids grew up with bookstores being such a wonderful treat where they could get their treasured favorite book that they could take time picking out then keep as their very own — amazon just isn’t the same! Thank you so much for your comment and your visit to my blog! Nice to meet you! Annette, No question that Borders made poor decisions — and in this economy there is no room for error. I wish I had the option to go to a local B&N like you do (the only large bookstore in the whole state is a B&N an hour away). I hope they continue to do well! Sorry about the Borders scene in your town…. I wonder where those teens will hang out now? You are so lucky to have many options; I’m envious! Thanks so much for your comment! Lisa, Like you I do use amazon and libraries, too, a lot! I think as you say it will be a continuous adjustment of the mix — good way of putting it! I hear what you say about the stories being important. I sometimes worry that although the physical format (of the stories) isn’t important, it is important that we maintain the physical buildings/locations where the community can go to hear or see these stories… and in Maine those places are dwindling! Meg, Thanks for understanding! It really is sad to say goodbye to places that are important in our lives with our children — and our Borders was certainly that to my kids and me! Thank you so much for your comment and your visit to my blog! As a writer, the closings are nothing short of depressing! Writing is such a solitary endeavor (thank God for Twitter! ), and I think we all fantasize about walking into a bookstore and seeing our physical books on display…or even giving a reading or book signing! With bookstores disappearing, all of our marketing endeavors will soon be happening in virtual reality. This might be a relief to the most introverted of us (and we’re all a bit introverted, I’ll wager!) but at the same time I’ve dreamt of getting out there and talking with readers real time. Please, B&N, just hold on until I get published so I can stalk readers in your aisles. Please! Stephanie, I agree — as a writer, realizing I may never see a book of mine on a bookstore shelf, I’m depressed! When I went to Borders with my daughter, I saw several books written by Twitter friends, and I wanted to buy ALL of them! Or take photos of them at least! I ended up buying one! As you say, online marketing may be a relief to my introverted side, but I still want to be there at least as a fly on the wall to see people buy my books…. I so agree with you about B&N hanging on — for you and for me and for all of us! Happy stalking! Great post, Julia. Reminds me of the movie “You’ve Got Mail,” for some reason. I LOVE bookstores, from the small and intimate to the large and multi-faceted. As a person seeking to self-publish, I have conflicted thoughts about this. I also own a Kindle and love it. So maybe I’m part of the problem. I don’t believe all bookstores will go away. I think they are an experience we won’t be willing to part with. We need to strike a balance, and we are still in transition. Christine, I will definitely be willing to accept that it reminds you of You’ve Got Mail — what a nice compliment! I don’t think any of us are a problem; we’re all just part of the discussion, figuring it out, just like all things in life! As you say, we need to strike a balance and we are still in transition, no question…. The real unknown is what will happen along the way! Ugh! What a scary, scary thought … one I’ve been wondering about myself. I can’t imagine not being able to immerse yourself in row upon row of books, being able to tangibly touch a book, flip through it, smell it, decide which to choose – or in my case, choose so many, you need help at the register. I never thought about Target and places like it being the ‘replacement’ for bookstores. Please, no! No! I remember when Borders burst onto the scene in my hometown. I actually always preferred it to B&N, but then I really don’t read, so…. I live in Ontario Julia where Chapters is my bookstore of choice. If they ever close I will weep buckets. I secretly want to live there – have my own tiny apartment in the back and spend lots of time perusing the books and drinking Starbucks coffee! My friends could visit me there, and oh they can never close. I can truly understand your pain. I’m so sad about Borders. My daughter went to story time every Wednesday. Her “teacher” was amazing and since they found out the day before story time it was an emotion filled final story hour. We all cried. I hate what’s happening to bookstores. I can’t imagine a world without them. They’ve been my favorite places since I was a child. I used to choose bookstores over toy stores. It’s a terrible loss. I’m sad to see Borders closing. My Great Books discussion group has met there for years, I’ve bought books there that have changed my life. I have a Kindle and I buy a lot of e-books and “real” books from Amazon, but it’s nice to be able to wander the shelves and find something unexpected. We still have Barnes and Noble and some classy independent bookstores, but Borders was 2 minutes from my house. No, this generation of kids won’t know about the thrill of bookstores or even libraries. Our city libraries are cutting hours now, too. I’m sad to see Borders close because of what it means for the industry, but I don’t have the emotional attachment to them that some do. For one, I live in the Portland area so my local bookstore is Powell’s. Now, if Powell’s closed, I would curl in a ball and cry. There’s nothing better than spending a day wandering the different rooms, getting a latte, going back out… wandering the neighborhood… I love Powell’s. The other reason is my love for Amazon. I understand the frustration with e-tail, but I do love being able to find almost ANYTHING I want, all in one place, and get it shipped to me for free thanks to my Prime membership. I go to Powell’s for the experience (and when I have time to get over there), but if I just need to buy something today, I hop on Amazon. Awwww, Julia – I’m sorry. I hate when a beloved store closes. I have never lived near a Borders…and our local book store in the mall is awful. If they closed it wouldn’t be a hardship. I’ve been an e-reader since the very beginning. I bought the very first Kindle the very first week and keep thousands of books on it. I love the computer and the internet, but hand write letters often – I think it’s a lost art. Melissa, Exactly my fear! Especially with young children — which was why it really struck me, being with my daughter, seeing those two little girls with their mom. That Target experience will be THEIR memory with their mom. Thank goodness they’ll have that! But here in Maine, for now, that’s all! Hopefully we’ll get a replacement at some point. It’s puzzling because I live in the most populated (southern) part of Maine…. Elizabeth, Chapters is a lovely name for a bookstore! I know what you mean about wanting to live at a bookstore — another dream of mine was to own one…. maybe not the best time to invest! Thanks for understanding, and here’s hoping your dream of living and drinking coffee at Chapters comes true! Thanks for your comment and your visit to my blog! Kelly, Your daughter’s feelings are the same that my daughter had — I’m sorry your daughter is so sad, terrible! My daughter didn’t cry but I think she’s just incredulous because she and her brother always wanted to go to the bookstore as often as I’d let them, just like you did! They’re both still in love with books, thank goodness, and I’m sure you’re daughter will be too! thelmaz, I never thought of all the book groups that met at Borders! And it made me think that I know of writers’ groups that meet there too! You really captured my thoughts — I also own a Kindle and I often shop at amazon, too, but it’s the wandering of the shelves to find something unexpected that I’ll miss! As for libraries, I also agree with that. The world is definitely changing! Nancy, I’ve heard wonderful things about Powell’s bookstore and I’ve always wanted to go! You’re so lucky to have it, and I hope it will survive — such an iconic place. I completely agree about Amazon and the ability to find anything… I agree that bricks and mortar are for the experience and amazon is for the convenience and find-ability! Maybe it will all settle out and there will be a place for both in the future. Oh, I loved the Borders by my house when I was a teenager. The idea of having so many books at my disposal was amazing, though of course back then the local shops were rightfully worried. All of this makes me so sad too. I’m sad about Borders, and I’m not. As others have pointed out, they (and Crown Books before them, ‘member them?) drove a lot of smaller indie bookstores out of business. Maybe indies will make a comeback, or maybe bookstores will be permanently changing, just as Netflix displaced Blockbuster and is itself now losing ground to stream-on-demand movies. It wasn’t so much people going to Amazon that killed Borders – though that was a factor, as Amazon plus the down economy PLUS some really crappy business decisions. Maybe the owners will be willing to lease the empty Borders store for less than the normal commercial rate to small indies to keep them occupied. (I can dream, right?) Still, terrible for people like H, I know. Beverly, It will be interesting to watch what the fall out from Borders closing will be, no question! As you say, Netflix and Blockbuster are going through similar jockeying around. I hope you’re right that some Indies get together and lease the empty Borders… hard to know what will happen but also hard to imagine a city as large as Portland Maine without any large bookstore! My friend H thinks/hopes B&N will come to town. We’ll see! Well you know how I feel — totally depressed about the Borders situation. We went a few weeks ago and it’s so sad to see the cafe closed up and piles of books everywhere. We always loved going as a family to check out the books and I’d also read to Sophie in the kids section. So sad! And by the way, that is an awesome-looking Borders you have with a barn-type roof! Such a bittersweet story. The memories are great. My favorite memories are walking in with my computer to write at the coffee shop area and being absolutely filled with a desire to see my book on the shelf next to all the others. It was great inspiration. I’m hoping maybe this will give growth to more local shops? I hate it for all the folks who are losing their jobs, hopefully they’ll be able to put their love of books to use in other areas. EJ, I certainly share your dream and inspiration of seeing my book on a Borders bookshelf next to all the others…. it’s hard to realize that will never happen! I also share your hope that this will give growth to more local shops… it’s a shame that as things grow and change, good people need to worry about their security in all this; here’s hoping they can use their love of books in other areas, as you said. Truly bittersweet. We’re having a hard time w. our local Borders shutting down too. It’s right beside a Target. However the good news is that this will mean we’ll need to take more trips down to DC to an independent bookstore, Politics n’ Prose, which is our absolute fave. All the employees in Borders are bummed. I wonder what they will replace all these empty bookstores with. One shudders to think. Ado, How lucky for you that Borders is right beside a Target — you won’t have to go far to repeat the picture I took AND you’ll have comfy bouncy balls to sit on…. Seriously, how much luckier are you to have other bookstores to go to!? I am concerned about my friend H and all her co-workers — I think she’s really hoping a B&N will move into the area….